A local woman’s method of teaching kids maths is being embraced by schools around New Zealand. Frances More’s multi-sensory system teaches children the times tables by using their fingers. Young people can learn to multiply, divide and work out fractions using her method. The system is proving a huge hit among parents, teachers and students. Ms More has taught it in schools around the South Island with 100 percent success. “Some of the 5-year-old kids I have taught couldn’t even count, yet they learnt their two times tables,” she said yesterday. Her programme is being used in schools around Christchurch and Dunedin. She has also written a book, Elephants Never Forget Their Times Tables, which is waiting to be published. Her website, www.fingerithmatic.com will be up and running next week. Ms More comes from a farming background. She came up with her math system after teaching adult numeracy and literacy at the Challenge Work Skill Centre in Temuka. There she realised how many people had slipped through the cracks in the education system. Ms More has also developed a maths kit, which she plans to market throughout the country. The system will also be available on the Internet. As far as she knows her programme is the only one of its kind. Ms More plans to add to the system methods for remembering history, spelling and science. FINGER LEARNING: Frances More with her innovative learning system based on the learning all people have in their fingers. Frances More's fingeithmatic method of learning mathematics has helped thousands of children grasp basics in minutes and she is confident her new programme will achieve the same results with spelling and reading. The key equipment requirement for all Frances's teaching methods is fingers---with them and using the senses of visualisation, movement, vocalisation, suditory, sight and touch children and adults can learn times tables, division, fractions, touch typing, read a clock and now spelling and reading the most difficult words quickly. In fact, they learn so quickly Frances is making herself redundant, she explained with a grin. "Its not a bad way to go out really," she suggested. Frances is confident anything can be taught using her methods-- to prove her point shhe quickly reeled off the world's greatest rivers and the worlds highest peaks and their heights using her fingers. Fingerithmatic, and now the associated spelling and reading method is a multi sensory or accelerated learning technique using the memory we all have naturally in our fingers. As an adult literacy tutor in 1999, Frances realised there were gaps and a need for an easy, fun and quick way of learning mathematics. Since developing the system she has taken it all over New Zealand with an unparalled success rate. When she was approached about developing a similar teaching method for spelling and reading she jumped at the task. 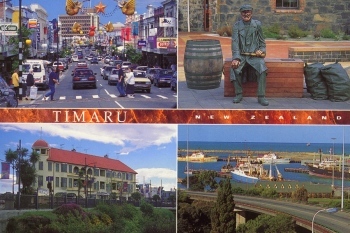 Developed in 2002, she has since taken it on the road teaching 20 teachers in Tokoroa and taking lessons for adults who worked in the local industry sector. When a 32-year-old man, who had never been able to read or write in his life became as excited as a child when he quickly picked up a simple three letter word, Frances realised she had it. The programme involves all of the elements of the fingerithmatic as well as scrabble letters. 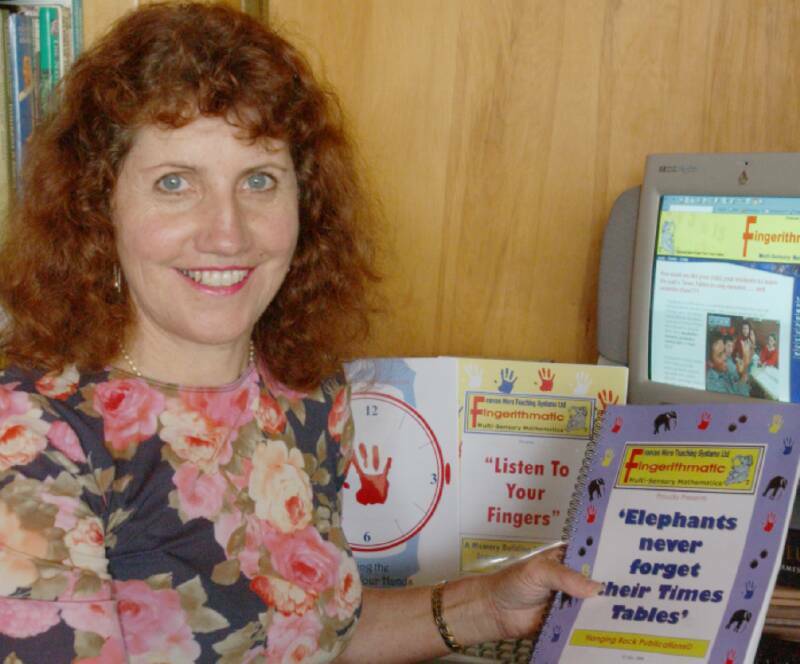 She trialled it at a small Southland school and the results were instant with even the children who were having the most difficulties with spelling picking up the fundamentals while having fun, she said. Fingers are transformed, becoming letters and suffixes and a trusty dictionary is always on hand in order for word meanings to be established. "My system will bring those students struggling up to a higher level and those students achieving will leap ahead further----it can close gaps." The entire programme is just four pages long and available from Frances's website www.fingerithmatic.com for a reasonable fee. Frances also offers tutoring and can be contacted at 0800 Learn quick. "I have parents that ring me in tears because their children aren't coping at school and can't seem to learn. It's great to see the children transformed when they find out they can do it."